As attention turns toward the government-created humanitarian crisis at the U.S.-Mexico border, immigration officials are slowly encroaching into other parts of American life. 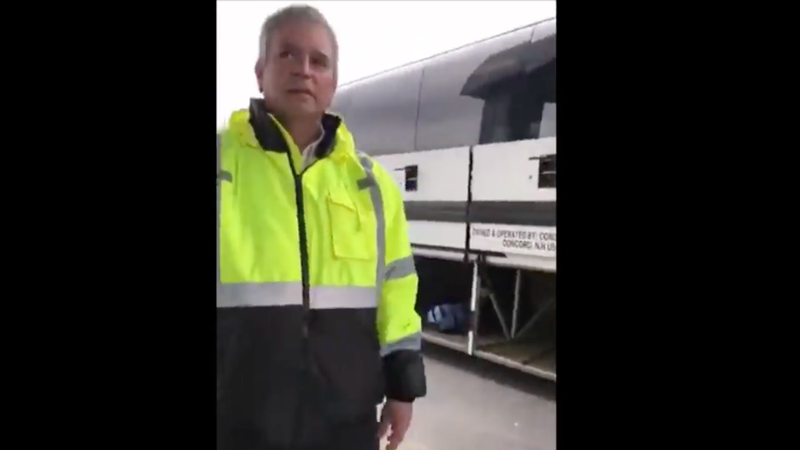 Over Memorial Day weekend, under the gaze of a Border Patrol agent, a bus driver in Maine told passengers that they needed to be U.S. citizens in order to ride the Concord Coach Lines bus. Video recorded of the incident (h/t HuffPost) and shared by the American Civil Liberties Union of New Hampshire shows a U.S. Customs and Border Protection agent questioning passengers about their citizenship status. “Are you folks U.S. citizens?” the CBP agent asks as he strolls down a line of people waiting to get on a bus in Bangor, Maine. “I’m not answering that question, sir,” a man responds. A female passenger then asks the bus driver if passengers need to be U.S. citizens to ride the bus. “Yes,” the bus driver says. Incredulous, another passenger repeats the question, to which the bus driver responds, “Yes,” again. But Blunt’s answer glossed over one simple distinction that needs to be made: There’s a difference between interfering with a government authority and spreading misinformation on behalf of that authority. As the ACLU states in its video, there is no requirement anywhere in the country that restricts travel to U.S. citizens; nor do people need to affirm their citizenship just to ride a private bus (or a public one, for that matter). The ACLU called the U.S. Immigration and Customs Enforcement’s use of the bus terminal to conduct its business “morally repugnant” and reminded viewers that they have the right to refuse any questions about their citizenship. The video comes amid a growing public outcry over the Trump administration’s enforcement of its “zero tolerance” border policy, which calls for federal agents to strip children from their families at the border. Donald Trump has implied that this practice of ripping families apart is a negotiating tool in order to force Democrats to fund a new border wall, as well as impose new limits on legal migration to the U.S. The administration is also reportedly looking to strip naturalized citizens of their citizenship if they’re suspected of fraud. And as HuffPost notes, this marks at least the second time this year that Border Patrol agents have harassed people riding bus transit within the U.S. The Greyhound bus line was criticized earlier this year by the ACLU for allowing Border Patrol agents onto its bus to ask passengers for IDs. Greyhound has the right to demand a warrant from Border Patrol officers to board its buses, the ACLU says.